The Butterfly wings are done off mandrel as a thin pendant that hangs from a jump ring. 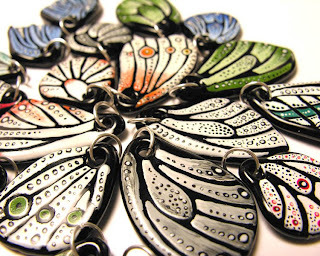 Just like my Beetle beads, they're sculpted in the flame and painted cold (and then returned to the flame) for color and detail. 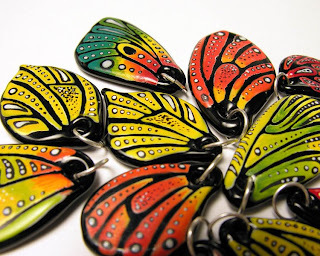 Also like the Beetles, these are completely stylized, not representative of any actual species of butterfly. The wearer can opt to sport one, or mix/ match two to make their own imaginary butterfly. The doodles are straight up fun. I had a bit of a creative slow-down/ slump last year... It happens- with attention on other projects, life, and all that. 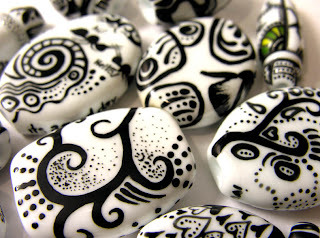 These really helped me get out of the slump... uncensored, plenty of room to play, but very simple technical contstraints (white bead, black paint). 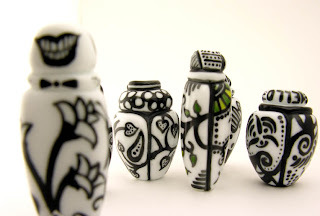 The doodles are a very literal translation of my journal pages into a bead. The first few I made were meant as a creative exercise- not something I expected to turn into a product.... but then I realized how much time I spent giggling, smiling, and in a generally positive and playful place. So, wanting to bring more of that play into my day to day creative world, the Doodles and Doodlebugs (and there's a DoodleBall not yet photographed) were born. Lovely, Margaret. Thanks so much for sharing them.